We are absolutely delighted with the table - it is wonderful. The extra length was definitely the right decision, and now the edges are balanced, it is just perfect. So, we are very happy customers. We will snap a few pictures so you can see the piece in situ. Many thanks again for all you help and support and persevering to make sure we were completely happy - which we are! In a word the desk is amazing!!! The day it was delivered my wife was sending me pictures of your guys assembling it and I couldn't wait to see for myself. I wasn't disappointed, in fact it exceeded my expectations for quality and craftsmanship. 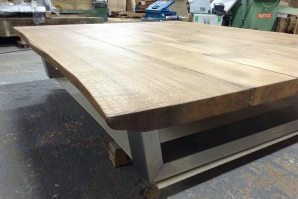 I was particularly impressed with some of the design features such as how the base is bolted to the table surface, the plates having slots rather than holes bored into them allowing for potential expansion and contraction of the wood. Everything about this work of art is solid and shows the attention to detail, from the beautiful sculpted edges to the satin finish. I wanted an heirloom and this is what I now have. My visitors were mightily impressed, and I received nothing but compliments and calls for your details, which I was happy to supply them with. I even took a few photos to send to friends and family back in Canada, only to elicit the same types of comments. One person remarked on its timeless quality and I would add adaptability which is a function of its simple, elegant design. No matter what our decor or circumstances in the future I doubt we will ever struggle to have it fit in. I can’t sign off however without mentioning the superlative service you delivered from beginning to end. Your delivery team were courteous and professional and the chocolates and wine much appreciated. Congratulations on running such a fantastic business. Being an artist is a great vocation but so is making people happy. Just to thank you for the wonderful table, I am so very pleased with it. But biggest thanks must go to the lovely guys who delivered it and installed it on got to be one of the hottest, most humid days, having had a few deliveries from - have to be careful what I say, but these guys were great and a credit to you and your business. Thanks again. Over the moon with it! Just about everyone who has seen it has commented and asked where it has come from. The table is amazing – we love it and so do all our friends who have seen it so far! Everything so far has been fantastic in terms of service. We are delighted with the table - it is a focal point within our kitchen and is in constant use. Every visitor that we have had has remarked on what a beautiful table it is. The build quality is everything I hoped it would be; lovely thick pieces of oak and just a simple but hugely strong steel support. It is head and shoulders above all the other tables we looked at. Please also pass on my sincere thanks to your delivery guys. Shortly after they had left I noticed a minor issue with how the planks had been attached to the base. Even though they were a couple of miles down the road when I phoned them, they came back and sorted it out without any complaint. I know many companies/delivery teams would not be so obliging. I love it. The whole family love it! Even my partner who rarely compliments. I was worried it would jar with the Oak floor. Or look to big. Or look too contemporary for a 16th century farmhouse. But it really works. It’s solid presence centres the room and actually makes the room feel bigger. My nervousness was after scouring online for months trying to find a coffee table I liked that wasn’t flimsy looking or looked too designed. Your tables are beautifully simple and let the stunning wood grain take centre stage. The service was great and I have no suggestions to improve that at all. We are both over the moon with the table and chairs, they look even better than we anticipated and it is the star attraction in the room now.The whole set fits in with everything perfectly and strangely its 30cm longer and 10cm wider than our last set but the room now looks bigger with this one in it. I was a little concerned that the chairs might not look as good/expensive as they do, but they have a real quality about them just the same as the table and bench. Very happy customers. Had to tell you how pleased we are with our new table perfect fit and match. The whole shopping experience from sales to visiting the workshop to the guys who came to set it up was brilliant. In short, I am pleased as punch! Thank you so much! The guys that came and installed the table were punctual, polite and very efficient. The end result is an amazing table which is real talking point! Thanks again so much for a brilliant service. We purchased a large dining room table (metal legs, oak top - sorry I can't remember it's name!) from you and are delighted with it. It's the centrepiece of a large dining room, great for large gatherings and gets so many admiring comments from our visitors. The quality and craftsmanship are clear to see. The service we received from ordering to delivery was personal and professional. Thank you again, we wouldn't hesitate to buy from you again and often recommend you to friends. Thank you for our table, it's beautiful. 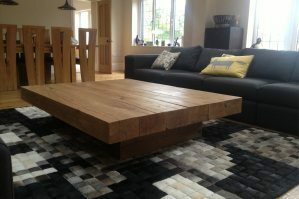 We are absolutely delighted with our table - it is so well made and has quickly become the feature point in our lounge! Delivery service very good - the guys that assembled table were so patient as we decided upon the best position!! Would recommend 'Tarzan Furniture' to friends and relations. Many thanks for such personal caring service and advice throughout the process of our purchase. Much appreciated. Morning John, Table turned up and the guys fitting it together were very helpful. It looks great and we are very pleased with it. Hi John, Table is great thanks. I love my table, and must let you know. Your 2 really nice guys that delivered and installed my table were lovely. It is really nice to have a finished product delivered by polite and professional gentleman. Thank you for your kindness and please thank you delivery team, they were tremendous. This is a bit late (I was away so) I didn't even see the table until it had already been here a fortnight! but I wanted to tell you how much I love it. It has had many positive comments! We are very pleased with the table thank you and with the service from the delivery and installation people. It looks wonderful in the room and it’s a really great centre feature. Absolutely love the table and the lads that delivered table were great. Many Thanks and I'm sure I'll be in touch again for more furniture. Your delivery men have just left, thank you for the beautiful furniture. I really can see what the money was for, the wood is amazing and all solidly built. Thanks for the delivery of the tables , very happy with the table and the tv stand which both look and fit perfectly. Please pass my thanks on to your delivery men who provide a good professional service , delivery and fitting. Love our table! I wanted to let you know how happy we are with our table. It is beautiful. The quality is fantastic, style perfect and the imperfections of the wood exactly what we wanted. Thank you for creating such a lovely talking point for our new home. We are happy to recommend Tarzan Tables to anyone that asks. Thanks again. Table looks great….the room looks properly furnished … and its drawn lots of positive comments already! many thanks again….brilliant service from you all. I would like to take this opportunity in thanking you and your colleagues for a very professional job. The guy's who built and installed the table were very informative and professional in their work. They are a credit to your company. Your company has been a pleasure to deal with and the two guys that delivered the table were fantastic, thank you again. Just like to say thank you so much for my Amazonica table, we think it looks fab in our room. Thanks also for your prompt and efficient service, really do appreciate it. I would just like to say how thrilled we are with the table that we bought from your company,Tarzan Furniture. It gets lots of admiring comments from our friends as it is so different with being 100% natural wood product. Having had it a year and now refurbished, it is like another brand new table. I have to say the service offered was exemplary in all aspects; communication, replacement table whilst work was being done and the finished product. Good service is a rarity nowadays, and generally the bigger the company, the worse it becomes, but your service in all aspects is a credit to the retail industry. I would recommend you to all my friends. Well done and many thanks. After care really matters because when we bought our oak beam table from Tarzan it was still alive! 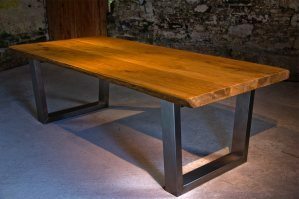 Real wood has character and moves (unlike MDF or marine ply) so after a year when our table had settled into its final shape it was time for it to be serviced! Tarzan picked it up, refurbished and re polished it, and brought it back looking even better and feeling as solid as a rock. There's something nice about sending your table off to be serviced! Well done Tarzan crew, it looks great.